Less than a day after Metal Sludge and Sleaze Roxx announced that guitarist Michael Grant was no longer in L.A. Guns, the band has released a press release in that regard but have yet to name a replacement. The group’s next gig appears to be at The Canyon in Santa Clarita, California, USA on April 6, 2018. LOS ANGELES, CA (March 7, 2018) – Michael Grant announced that he left L.A. Guns effective March 5 to pursue other interests including his solo project, Michael Grant & The Assassins. L.A. Guns thanks Michael for his contributions, and we wish him all the best with his future endeavors. “Endeverafter was formed in 2004 by lead singer and guitarist Michael Grant. After the rest of the band was assembled, they released their debut EP in 2005 and played regular shows in their hometown, featuring confetti and strobe lights. In 2006, the group signed with Epic Records and recorded their debut album, From the Ashes of Sin, with producer Stacy Jones. 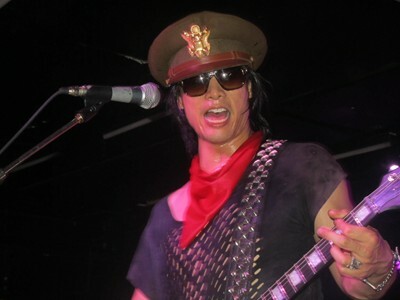 Drummer Eric Humbert, formerly of The Red Hot Valentines, joined the group in early 2006, replacing Austin SinClaire. They toured in mid-2006 with Cinderella and Poison, also opened a couple of shows for Kiss in Japan, bringing their music nationwide while recording their album. After several label changes at Sony/Epic and numerous release date changes, Endeverafter finally released their full-length debut album Kiss or Kill on Indie label Razor & Tie in October 2007. Later that year, the single “I Wanna Be Your Man” hit #25 on the U.S. Billboard Mainstream Rock Tracks chart. In late 2007, they toured with Trapt and Fuel. The band’s song “No More Words”, which appears on the album WWE The Music, Vol. 8 was used as Jeff Hardy‘s entrance theme and was released in March 2008. At the end of January 2008, Endeverafter performed a show at Motley Cruise, a four-day cruise in the Caribbean (Miami, Key West and Cozumel, MX) with Vince Neil, Skid Row, Slaughter, Ratt, Lynam and toured with Roadrunner Records artist Airbourne through spring 2008. They did a one-off interactive show on DeepRockDrive.com on May 23, 2008. They also released their second single, “Baby, Baby, Baby” to radio stations in late May, which peaked at #38 on the Mainstream Rock charts. They appeared on the “Road to Destruction” tour supporting Saving Abel through June 2008. On June 27, 2008, Endeverafter opened up for Alter Bridge and Shinedown in El Paso, Texas, at the KLAQ Downtown St. Festival. Their song “I Wanna Be Your Man” is featured as a downloadable track in Rock Band 2. In 2009 the song also appeared in episode 1 of the 8th season of Scrubs, titled “My Jerks”.